Chicago Party Place presents our inflatable Axe Throwing experience. Axe throwing has become the newest fad. We at Let the World Know/Chicago Party Place have a much safer activation for special events and parties. 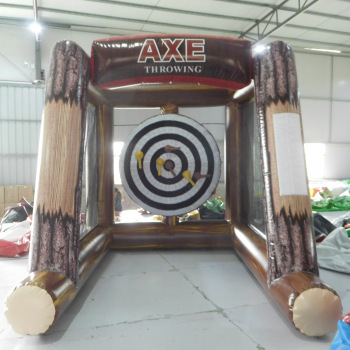 It's a very attractive inflatable design and offers participants chances to land axes in the bullseye area...Axes are made with velcro tips and are perfectly weighted to give the sensation of throwing a real axe! This is safer and easier to play than real axes!